The project Mimesi/Metessi is an interactive performance inspired by two basic concepts: the Freudian “uncanny” as scary and disorienting that emerge if stimulated because we have known and unknown at the same time, and that of transgenderism seen as a moment of “transit” over his own body, on / in that of others. In everyday life there is often a feeling of loss caused by the discomfort of discrimination at the hands of “the other from us,” that human being like us, but totally alien to our life, family circle or in other cases to dissimilar traditions, customs and beliefs . The Mimesis (imitation) and Metessi (participation), may be of empirical tools through which you can create a non-verbal communication and deep exchange between different subjects. 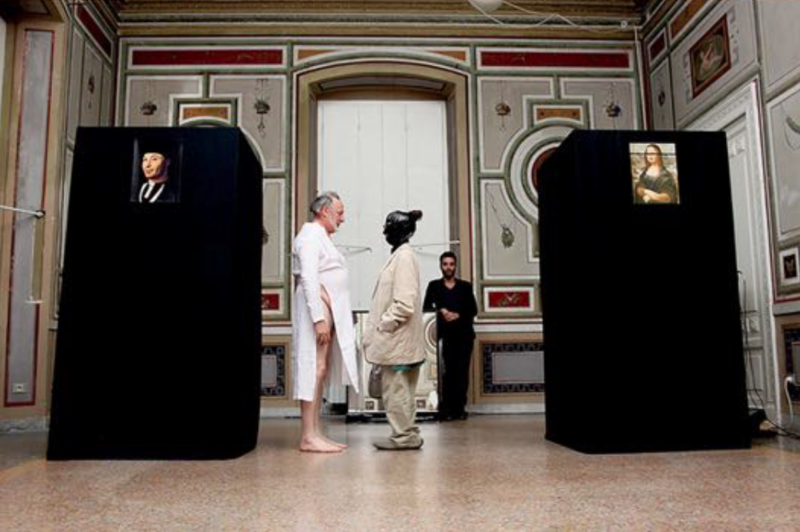 The performance is based on the exchange of clothes, which become a metaphor for extreme and distinctive identity, as shown by the studies of Adam D. Galinsky of the Kellogg School of Management at Northwestern University (USA). In fact, step into the shoes of others allows us to perceive us in a different way from the usual and the discovery of one’s own identity and dress-it helps to understand it. The exchange of clothes can therefore become a cognitive and cultural exchange. This will create a two-way and reciprocal double experience: watching themselves on the body of the other by altering the perception of oneself and watch / hear each other on our body, perceiving the differences / similarities with empathy. This melting pot will take place by two booths, one performer, in the other the guest interacting. 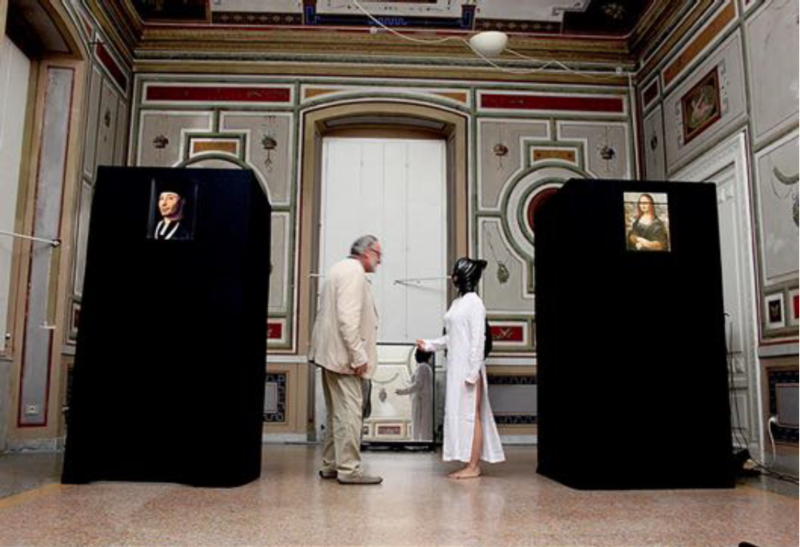 The performer asks the guest to be able to exchange their identity through clothing. The two then wear the shoes of others will be compared with mimetic gestures and movements. Juxtaposed to the booth there will be two representatives of the unknown universal emblematic images. 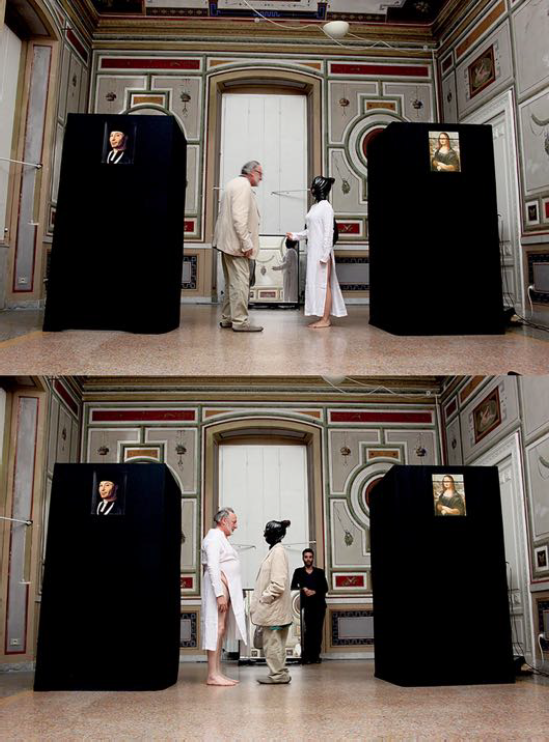 The two portraits are transgender, “Portrait of an Unknown Man” by Antonello Da Messina and the “Mona Lisa” by Leonardo (on interpreted by Duchamp). The entire performance will be interacted by a live musician (Valentina Amandolese) through the use of synths. The audio product will create an advantage in the exchange of clothes. Leonardo Sciascia theorized an order and biotechnical similarities to that effect recognized in the “Portrait of an Unknown Man,” the “likeness”, the unknown universal attributable to each of us. A similar argument can be done for the Mona Lisa by Leonardo Da Vinci, who in his Duchamp’s readymade expands even more universal sense of this woman / man unknown, uncanny; an anonymous stranger universal. During the action, the performer will wear clothes that underlie the precise roles in society with the aim of highlighting the diversity of identity, transgenderism inherent in all of us.